Writing this feels a bit like I should dust off the blog first. It’s been a while and I don’t really know why. Other than that I seem to have been hit by a severe case of “Frühjahrsmüdigkeit” and I’m not even kidding with that. I was slightly more busy at work and with local politics than usual, but that alone doesn’t explain the bone deep tiredness that set in every afternoon. When I got home all I managed to do was sluggishly prepare some food, watch some mindnumbing Netflix and go to bed. I even slept a bit more than usual, but to no avail. In all of my now 44 years I’ve never ever felt like this in the spring. It’s annoying! The “Breathe. Be Kind. 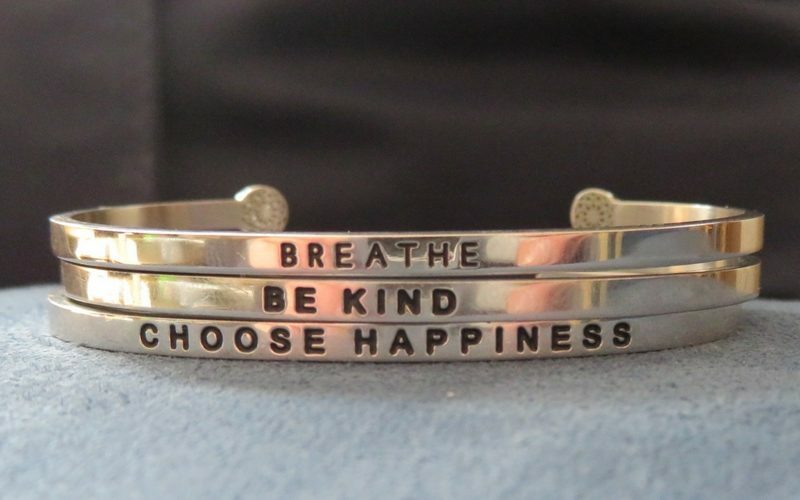 Choose Happiness.” bracelets I’m wearing at the moment are also a good reminder to do exactly that. To just take a small break. After I’ve been quite busy the last two weekends, I was rather lazy at home this weekend and I really enjoyed that. Sleeping. Making lists for my Scotland vacation. Picking up some books again to read a bit. Watching a new (to me) show on Netflix. Getting some things done on my long to-do-list. Not as many as I had hoped, but I’m not being too hard on myself for that. Neither am I beating myself up for still not really having developed a consistent workout routine. This year it feels like equally steps forward and back, but… at least I haven’t given up yet and I’m willing to start over and over again. That’s a small victory in itself, isn’t it? For me anyway. Looking out for the bright side and all. In a “As long as you’re living and you’re having fun” (Frank Turner lyric, of course) kind of way, a few days ago I even bought a ticket to another Frank gig in August, which will give me a nice “one for each summer month” (Duisburg in June, Wiesbaden in July” triad and I’m totally fine with that.